A quiet mountain town much of the year, Takayama’s Spring and Autumn festivals are two of Japan’s best, and draw crowds of revellers from across the country and overseas. Like Kyoto’s Gion Matsuri, the Takayama Festival centers around a parade of elaborately decorated floats, which are brought through the old town’s narrow streets between the specially decorated houses. Properly known as the Sanno Matsuri, Takayama’s April festival celebrates the return of spring to the town, which is snow-bound for much of the winter. The Sanno Matsuri coincides with the early blooms of Takayama’s sakura cherry trees in mid-April, and the costumed townsfolk, floats, and giant marionettes are a spectacular sight amongst the cherry blossoms. The Autumn festival, or Hachiman Matsuri, takes place in early October, and similarly features processions, floats, and marionette performances, and falls during the height of Takayama’s Autumn colours, with the turning leaves dramatically backdropping the festivities. Outside of the festival times, the floats used in the Festivals can be viewed at the Takayama Yatai Kaikan. 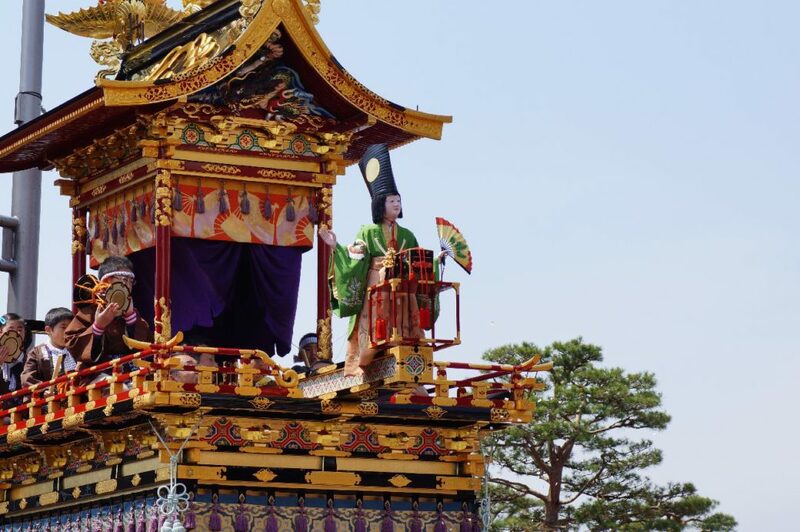 Into Japan Specialist Tours would be delighted to include either of Takayama’s festivals in your tailor made tour.